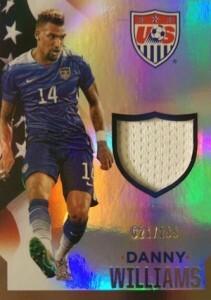 2015 Panini USA Soccer is a factory set that takes aim at the U.S. National Team for both the men and women. Each box set includes one autograph and two memorabilia cards. 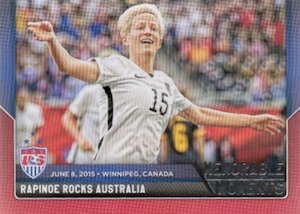 The 50-card base set celebrates the success of the soccer programs in the United States, including the full roster for 2015 Women's World Cup title team. The men's checklist features the Gold Cup squad and more recent international friendlies. 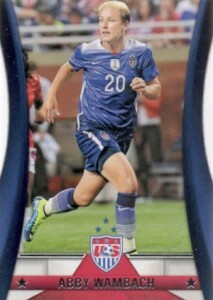 There are a total of 48 base cards and two team checklists, with one for the men and one for the women. 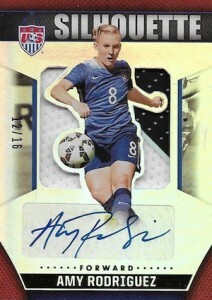 Focusing on the most recent history, Memorable Moments is a 15-card subset that includes the women's World Cup run and the men's international wins over Germany and the Netherlands. 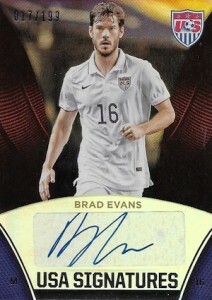 Falling one per box set, collectors can find autographs for both teams in the release. 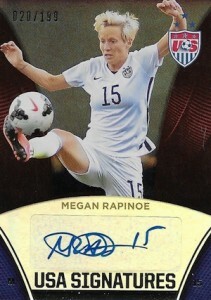 This includes USA Silhouette Signatures, which pairs a large match-worn swatch and autograph for key names. Memorabilia options drop two per box and include Dual Memorabilia cards with relics for two players. There are also combo versions for the autograph and memorabilia cards.